These rules represent the standards we expect from everyone using our platforms, be it in-game, on our forums, or in our Discord server. Please take a moment to familiarize yourself with these rules! Our moderation team will be enforcing them across our platforms, and failure to comply with any of them may result in actions being taken, up to and including bans from individual platforms or all of them together. 1.) The Golden Rule - Be respectful and considerate to those around you! Remember that on the other side of the screen is another human being reading what you've posted. Keep that in mind, and enjoy yourself while behaving! 2.) Episode Spoilers/leaks - Not everyone will have had the chance to view the latest episode at the same time of the same day as you; keep that in mind when discussing the new episodes. This also covers any leaked information; such materials should not be discussed. On our forum, any discussion of events that happen in the episodes/movies (whether they have been released or revealed in leaks) is to be contained spoiler tag until the Monday after the episode has aired, or one week after the movie has released; in the game and on our Discord forum, these materials should not be discussed until that same timeframe has passed. 5.) No Spamming - 'Ignorant', 'pointless', and 'annoying messages' basically sums up what spamming is. It isn't necessary to have your name on the front page for every single thread on the forums, or constantly on-screen in our Discord server, or filling the chatbox in the game. In forum threads, try to stay on topic; do not post things that aren't relevant to the topic at hand. Your POST COUNT has absolutely no meaning to it. a.) Any forum threads created in order to notify the public of anyone's projected absence from the forums and/or game, whether temporary or permanent, will be regarded as spam. If a user feels a need to notify one or more individuals about an upcoming absence of either themselves or anyone, they are encouraged to do so via private messages, or by posting information in a pre-existing topic regarding said parties in the "Introductions" board. 9.) No Flaming / Arguing - Intelligent public debate is welcomed, however the moment your post contains insults or personal attacks, you are in violation of this rule and your post will be removed immediately. These will not be tolerated on our platforms. We expect everyone to treat each other in a way which they, themselves, want to be treated, and that is with respect. 10.) Do not harass anyone - Harassment in any form is taken seriously. Do not do it under any circumstances; attacking, badgering, and repeatedly disturbing members is not only rude, but not allowed. Threatening other members will result in an instant ban. 11.) Inappropriate usernames are prohibited - Usernames can not be offensive, derogatory, or vulgar. If you register with a distasteful username, you will be asked to change it. If you refuse, moderation action may be taken; in addition, a staff member will change it for you. We are a family-friendly forum and game. 12.) Don't abuse platform features - there are features available on each of our platforms (e.g. in-game emotes, url / video implementation on Discord, moving text on our forum, etc.). Do not abuse these features by spamming them. 13.) Avoid sensitive material at all costs - Topics such as sexuality, religion, and politics have a well-earned reputation for getting heated pretty quickly. Do not attempt to talk about such things, or ever bring them up. Avoid posting anything like sexual orientation, religious standpoints, or political standpoints in any threads, discussions, personal text, and/or signatures. Our platforms are not a place for this. a.) Do not, under any circumstances, bring up "personal issues". You can talk about said issues in private/direct messages, but please do not burden the public space with your heavy baggage. 14.) Limited personal information such as Skype usernames, Discord IDs, etc. are allowed to be shared. Please note, however, that Legends of Equestria is not responsible for anything that happens in private Discord conversations, over Skype messages, etc. Personal information such as real names, addresses, phone numbers, Facebook links, and pictures of yourself should not be shared. 15.) Controversial Posts - If you believe something is controversial, questionable, or otherwise against the rules, do not post it! This also includes sharing links to any illegally shared/uploaded/downloadable materials, such as TV shows and movies. Discussions about these will also be severely dealt with. 17. )Keep discussions in the correct place - Each section of our forum is labelled for the specific topics that are intended to be discussed there; our Discord server is divided into various channels, each dedicated to a topic. If you want to discuss any particular topic, please make sure you're doing so in the correct place. Posts that violate this rule may be acted upon. 18.) 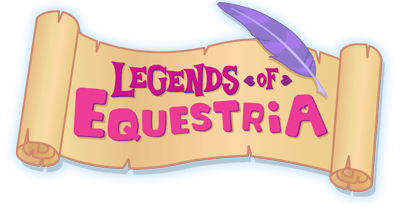 No hacking/exploiting of game files - Legends of Equestria is an ongoing project, meaning that bugs will be present that could be used to gain an advantage over players that aren't exploiting it. These are unavoidable, and are essentially to be considered part of the game until they are addressed. Once such a bug has been fixed, however, any attempts made, instructions given or materials shared to explain how to continue exploiting it (editing game files, modifying older versions of the client to connect to the server after an update to continue using an exploit, hacking, etc), or create/use any other kind of exploit that is not present in the latest version of the game without such modification, will be dealt with severely. If you find such instructions or materials, rather than discussing them in the chat, please share them with the team (by emailing [email protected]stria.com, reporting it through our Phabricator system, reporting them to moderation, etc.) instead. 19.) Double posting is prohibited - If you forgot something in your last post on our Discord server or forum, there is a handy features like the "Modify" and "Edit" buttons, which you can use to include the information you had forgotten. Frequent double posting on these platforms could be regarded as spam. 20.) Role-playing - In most of our chats, we allow for basic RP that is PG based. This means you can take plenty of different actions, but at the same time please keep it safe for work. If you would not let you parents or your grandparents see it then please do not do it. 21.) Powerplaying - "Powerplaying" refers to when a role-player takes control of another person's character that is not their own. This is not allowed, and moderators will reprimand those who participate in it. The only characters you are allowed to play as, talk as, and control are your own. The only exception to powerplaying, is if you and your partner both agree that you can control one another's character(s). 22.) God modding - The term "God modding" comes from the term "God mode" - allowing the player to activate features such as invincibility, unlimited ammo or lives, or similar power boosts. This is a juvenile thing to do, and it will not be tolerated here. 23.) More detailed role-playing is prohibited across most of the forum and Discord. Actions are fine, but don't turn it into a story. More serious role-playing needs to stay in the roleplay section of the forum. If you have any questions about these rules, you can contact our support address ([email protected]) or message a Public Relations team member through our Discord server for more information. > Any other information you feel should be considered. Please bear in mind our nature as a volunteer team when waiting for a response; it may take time to fully investigate any issue, but every appeal will be addressed.